Jeffrey Reiner is a middle manager’s dream. Predictable, almost invisible, and lacking ambition, he’s held the same tedious job for eighteen years, typing up the calendar listings for a South Florida weekly. As the economy and the newspaper industry crashed around him, Jeffrey kept his head comfortably in the sand until he was terminated in the middle of his lunch hour. Suddenly Jeffrey is staring at a deadline of twenty-one weeks before his severance pay and unemployment benefits dry up and he has to figure out what to do next. Plunged into the bizarre world of unemployment, Jeffrey’s attempts at networking lead him to his slacker neighbors, an unorthodox state facilitator, and a 1-800 mental health counselor. What’s even worse is now that he has no job to fill the daytime hours, he can’t ignore the fact that his family life is unraveling: his wife communicates almost solely through detailed daily honey-do lists; his mother seems determined to get herself kicked out of her assisted-living facility; his teenage daughter has no use for him and seems wiser to the ways of the world than he’ll ever be; and his son has taken up a disturbing form of pest control to help make ends meet. Even his dog finds a way to let him down. 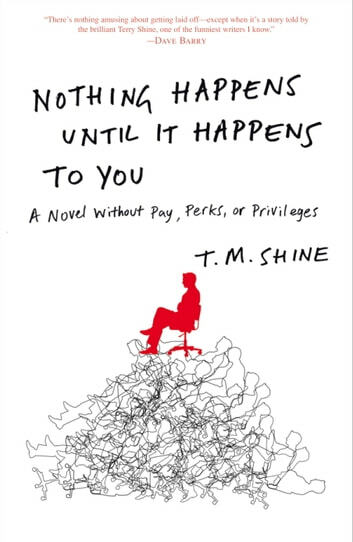 Nothing Happens Until It Happens to You is a weird, wonderful journey of self-discovery that proves there’s life after the pink slip after all.